The primary question any collector will want answered is, "Is this set worth buying?" The answer is a clear and unambiguous, "Yes." Rudolf Barshai is mostly wonderfully served by his orchestra and he rarely puts a foot wrong in the works of his teacher and compatriot. His engineers have done a generally fine job. The notes, by the unaffiliated Dr David Doughty, are useful and each disc has a separate archive photograph on the cover and the insert. As I received the set each disc is packaged in a separate jewel-case with its own notes and the whole comes in a large slip case which will look very well on the shelves. I believe other packagings are available. Whatever, at its price it is a remarkable bargain. But it would be a neglect of duty to stop there because this important issue is not uniformly good, indeed it varies from outstanding to slightly disappointing. So, on to the details. The notes with the first three symphonies also include a profile of Rudolf Barshai, which, I was disappointed to see, includes no mention of his work with our own Bournemouth Symphony Orchestra. The 1st Symphony is treated to an excellent recording with the lovely acoustic of the Cologne Philharmonie much in evidence. The orchestra is well spread across the sound-stage. The bass is really deep and the treble clean and natural. The splendid woodwind playing of the WDR Orchestra is very well balanced, as is the entire ensemble. The whole symphony goes exactly as one expects it to with no oddities, no interpretative intrusions, no "clever" ideas; just a straight and very good performance. 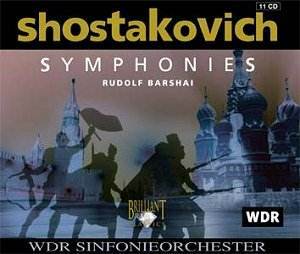 I felt as though I was listening to Shostakovich and not to Barshai�s "version" of him. This launched my many hours with this set in fine style and was a very encouraging start. It also turned out to be the one defining characteristic of the entire enterprise - the absolute absence of quirks from the conductor. This is pure Shostakovich; no one else intrudes. Whatever else one may have to say, that is a paramount recommendation. The long and atmospheric slow opening of the 2nd Symphony is well drawn and the busy scherzo that follows is performed with suitable punch. The Radio Chorus acquit themselves with honour too in their panegyric to "October, Communism and Lenin." It is hard to like this odd piece but I was as convinced by Barshai�s rendering as I have ever been by anyone�s. The 3rd Symphony, designed along the same lines as the Second, is perhaps still less effective despite all the hectic activity and choral and orchestral noise. I suppose that next to the comic racket of Mossolov�s "The Iron Foundry" it sounds quite restrained, but these two pieces are unlikely ever to join the standard repertoire. The massive 4th Symphony opens a little disappointingly in that the percussion is just not prominent enough. To get a real thwack in the solar plexus one has to turn to Haitink and the Concertgebouw on Decca, or even more to a Eurodisc CD of a 1988 performance by the USSR State Orchestra conducted by Rozhdestvensky. Barshai�s recording is slightly disturbed by much loud page-turning at various points, one of several indications that these performances were not studio based but derived from broadcast recordings, possibly in front of a very quiet audience. The opening movement of number 4 is a bit slow and there were moments where the strings sounded a little stressed, as well they might in this work of all the symphonies. At moments like this I missed the security of the Concertgebouw Orchestra under Haitink. If one�s neighbours are not a problem then this CD gains from an increase in volume since the finale�s earthquake climaxes do need space to expand. The 5th is given a very powerful opening by the strings with a brilliantly penetrating piccolo and a nicely audible piano. I also noted the horns were suitably ominous. A slight miscalculation of balance leads the solo violin to sound from the back of the firsts rather than the front but this is minor. Apart from the excellent ensemble displayed in this work I was mainly pleased by Barshai�s observing of an appropriately slow tempo for the "exultant" coda which Shostakovich once described thus: "It is as if someone were beating you with a stick and saying, �Your business is rejoicing, your business is rejoicing,� and you rise, shaky, and go marching off, muttering, �Our business is rejoicing, our business is rejoicing.�" (Testimony) This is a good 5th but I still would not be without Maxim Shostakovich (Collins nla) or Sanderling (Berlin Classics). In opening of the 6th there is again an unerring choice of the right tempo, which, with the very impressive horns, imparts a real heroic quality. The balance between string, wind and brass choirs is very well judged and the impression is given of separate threads developing in parallel; a real "large scale integration of contrasts" as such a symphony should be. The WDR Orchestra give such a good impression of being a Russian orchestra with pungent wind playing and powerful brass. What marks them out from most Soviet performances is that they are so well recorded. The string playing in this 6th is really magnificent. This is as good a performance of the Largo as I have ever heard. The wildness of the 2nd and 3rd movements come as even more of a shock after such intensity. The Allegro opens with utmost delicacy, everything very precisely pointed. Brilliantly done, if not as exciting as some I have heard. The finale is again not as fast as some but done with such fierce precision as to make it sound even angrier. There could, I accept, be more abandon, but this is outstandingly good.. There are some stage noises in the Leningrad that remind one of the recording source. If there is an audience present they are pretty quiet. The 7th starts off at a very determined tempo and once again the WDR wind sound remarkably Russian. The idyllic passage pre- the Nazi march is strikingly realised with every part balanced to perfection. This restraint and purity makes the onset of the march even more striking. The attack of the percussionists is really savage, a very brutal exposition indeed and the end of the 1st movement, when it comes, is a suitably bleak reaction. After a well drawn memories movement the adagio gets all the long, strong string lines it needs from this fine orchestra. Cologne Radio are a truly excellent band. The finale is good but I am no more convinced by this performance than any other. It is worth reiterating that there is a lot of extraneous noise in the Leningrad, more so than elsewhere. One can distinctly hear music desks creaking, pages turning, even brass players blowing clear their instruments. It is the earliest of these recordings and perhaps the engineers had adopted different microphone placements to those used later. No. 8's adagio is very slow and deliberate but, as always, played with great strength. Whether one should see this as Barshai being inflexible and relentless as befits the music, or as unwilling to go with the drama of this great movement, is a matter of personal opinion. Heard live I am sure this was impressive. The whole work is of a piece because the 2nd and 3rd movements are also very deliberate but played with great power. As mentioned earlier the performance just sounds "right" but it is worth mentioning that Mravinsky, the dedicatee, takes five minutes less than Barshai. Even so the latter is not as long-winded as Braithwaite in the recent Eloquence issue reviewed elsewhere on these pages. Having, after 7 and 8, been lulled into a sense that Barshai was going grey and relentless on me, I approached the 9th with some reservations. Would his unbending approach bring this lightest of Shostakovich�s symphonies to its knees. Certainly not. The first movement is brilliantly characterful with solo playing that really lets rip. "Smashing" I put in my notes! The 2nd movement strikes exactly the right nonchalant note. The 3rd launches back into "fun" mode. The short largo 4th movement, a Shostakovich joke if ever I heard one, leads into a steady allegretto finale, at least until the final outburst. Barshai passes the test with flying colours. Excellent! The 10th symphony is characterised by a lot of high wind writing and this is dramatically and relentlessly presented here. Onto the famous 2nd movement. Even at a steady tempo, nothing like as fast as Ancerl on the newly released DG �Originals� CD, the quality of string chording keeps the "portrait of Stalin" exciting and menacing. I noted earlier the quality of the bass sound and the slow movement, at the moment when the DSCH motif is blasted out in triumph, is particularly impressive because the bass goes down so far. It was the lack of that depth that made the 4th less gripping but it is present in spades here. The woodwind play magnificently throughout No.10 and by the time the finale has hammered its way to its close I was convinced that the performance was again absolutely right. I must lay my cards on the table with No.11. I love it! The more I hear the piece the better it becomes. Barshai is faster than my favourite Berglund (EMI) but from the very rounded muted trumpet sounds near the start to the huge clangs on the bells at the end this performance it did greatly impress. Perhaps there are moments where the engineers have taken fright and pulled the volume back but generally this works well. Barshai chooses exactly the right measured pace for the moments in the Adagio Eternal memory where some conductors feel they have to accelerate. Barshai�s unwillingness to deviate makes for massive impact. Again the wind section shine, especially the cor anglais in the finale. Barshai has almost exactly the same timing as Mravinsky and Cluytens in this movement. Since the latter recorded in the presence of the composer one assumes it to be correct. Superb! The opening of No.12 is steady but this has the advantage of allowing room for the tempo to increase as the movement proceeds. To be honest the symphony needs sensitive handling because it really is the weakest of Shostakovich�s works apart from numbers 2 and 3. Here it might be that Barshai�s "right" approach is just not enough. Listen to Mravinsky for a demonstration of how the work can go. However, Barshai builds plenty of tension. The hushed pizzicato opening of the Aurora movement is very impressive. This movement is the core "revolutionary movement" and the name refers to the battleship �Aurora� which shelled the Winter Palace in 1917. It is really atmospheric with very deep rich sound which makes the salvoes of the Aurora�s guns very cinematic. Barshai�s strait-laced approach to the finale either gives the piece much needed gravitas or defuses the excitement. The listener must choose. But listening to Mravinsky through a hail of coughing on a 1984 Leningrad performance shows what a devastating epic the 12th can be in the right hands. No. 13 is a choral and vocal symphony and I am sorry to say that Brilliant have included no words. This is a great pity because they really are necessary for the full impact of this masterpiece to be felt. David Doughty was probably unaware that there would be no words included because he doesn�t say much to help in the notes. However good this performance is, this is a black mark. [let the black mark be lighter by going to http://www.geocities.com/Vienna/Strasse/9570/shostakovich/texts.html - Here, courtesy of Alexandre H. Hohmann, you will find the sung texts in transliteration and with parallel English translation. Editor] On the up side we have a Russian solo bass and a Russian chorus. The soloist Sergei Aleksashkin sings with real passion and the chorus sounds equally involved. Even Barshai seems more inside this piece than the 12th. The big climax after the reference to Ann Frank in the first movement is absolutely devastating, as it should be. The entire Babi Yar movement is very moving indeed. The 2nd movement is done with just the right skittish, or even vicious, wit. It is very rhythmic and includes some terrific wind playing. Magnificently done but of course without the words ... In the Store is a hugely moving tribute to Russian womenfolk and their long-suffering patience in the face of war and oppression. The soloist is again very moving and the choral outburst on the lines "it is sinful to short-change them" is overwhelming. The massive Wagnerian growling from the brass at the start of Fears screws up the tension still more. Shostakovich seems to be wiping himself clean of some awful scourge in this movement. The chorus and soloist are outstanding. By the end I was exhausted and very moved. This is a great performance. No. 14 was premiered by Barshai - which makes the insult of no words still worse! [a Google search threw up the excellent Hohmann website which quickly repairs the omission] The first thing to note is how short the performance is compared to my current favourite, the BBC NOW recording on BIS. Barshai takes an amazing 10 minutes less than Wigglesworth. I have to say that neither soloist is as good as on BIS either. Who can easily compare to BIS�s John Tomlinson anyway? The soprano sounds a bit effortful at times and the microphones pick up a nasty edge to her voice. It is not a comfortable listening experience. The strings and percussion however sound very fine. The fifth movement, On the watch brings some excellent singing from Alla Simoni, as does the 6th movement Madam Look where her abrupt way with "and I laugh, laugh, laugh" is very Russian! I get so caught up in this magnificent symphony that I forget to be critical. The performance may not be the best but it is as good as is needed for this masterly music to make its impact. Again I suppose, just right! Finally to number 15. The WDR orchestra still sounds good. They are a very fine orchestra indeed, especially in this repertoire (one must not forget all the great things they did with Günter Wand over the same period). They clarify the many busy textures in this cryptic symphonic swansong. The cellist in the 1st movement solo is excellent too, as is the trombonist. I did begin to wonder if it wasn�t all a bit rushed though. The audience does not help either; coughing audibly on at least two occasions. For almost the only time in this huge cycle the orchestra goes almost off the rails in the allegretto - and again in the finale - a reflection I suppose of this being a set of broadcast performances rather than studio-edited perfection. Barshai takes over 5 minute less in this 15th symphony than do the likes of Haitink and Rozhdestvensky and overall I found him disappointingly perfunctory. With the orchestra also off form this last piece is not quite good enough. In summary this set includes at least four excellent performances, 1, 5, 9 and 11, and two great performances, Nos.6 and 13. Only No.15 is substandard, the rest are very good. Yes, you could accumulate a better set if you shopped around and spent a lot more money, but you would be unlikely to hear the works better played or better recorded except occasionally. As a way to experience one of the greatest symphonic cycles of the 20th century this has to be an essential purchase at this price.